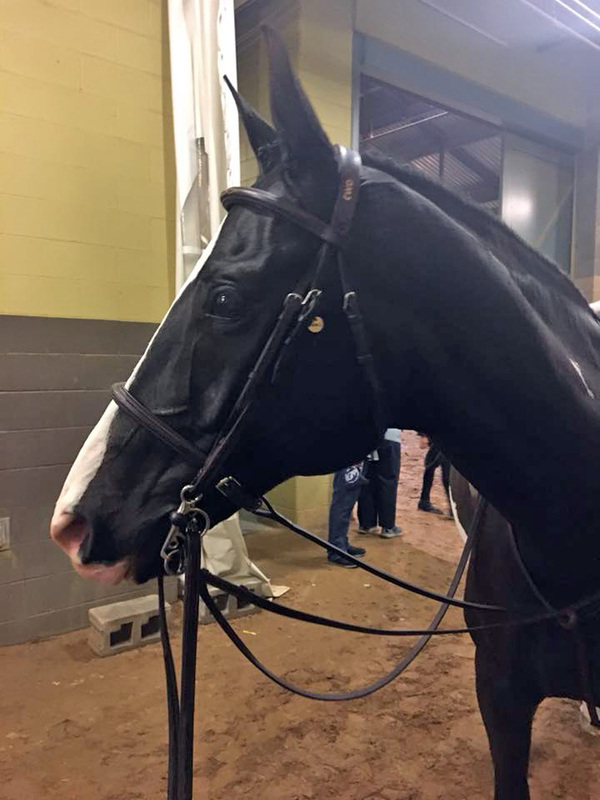 It’s been a little over a week since Simon and I returned from Kentucky, and I am still feeling ecstatic to have been able to compete in the ASPCA Maclay Finals at the CP National Horse Show. I consider Oregon to be one of the most beautiful states I’ve seen. After traveling to Kentucky, with its beautiful lush fields filled with horses, I would put it right next to Oregon as one of the prettiest states in our country. The drive from our hotel to the showgrounds took us by several incredible facilities with extravagant gates. The Kentucky Horse Park itself is so much bigger than I expected. The first day I hacked in the outdoor ring and thought that was the extent of the property. 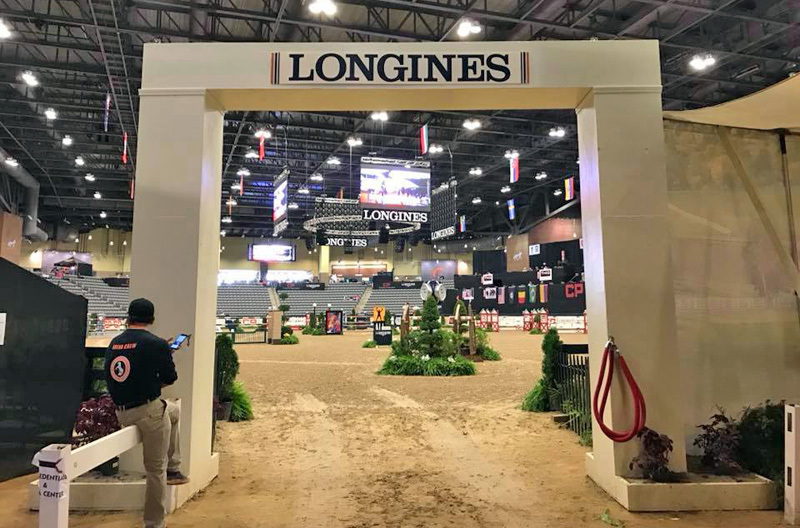 When I got to ride in the covered indoor for the scheduled schooling, I saw much more of the property, and it is amazing. It was nice to be able to meander around the showgrounds with Simon, and just take in the beautiful Kentucky scenery and have some quiet moments. Several people from my barn family came to watch me. My best friend even took the weekend away from college in Oklahoma to watch me ride and be a tourist in Kentucky. I am glad I was able to give them an excuse to attend the National Horse Show and visit some of the most iconic horse facilities in Kentucky. It meant a lot to me to have people from my barn family there to support me and Simon. Watching the livestream is so much different than actually being there. I watched last year’s ASPCA Maclay Finals, and the cameras only show the arena. In order to really do the facility and the competitors justice you have to see the place for yourself. The complex is so enormous, and it was a pleasant surprise to find it was heated. The stands surround the arena, and there isn’t a bad seat in the place. I was excited to get a chance to hack in the Alltech ring on Thursday, even though it was 10 p.m. the first time we entered the ring. It was stressful riding with some of the biggest names in our sport, and I tried very hard not to run into anyone. 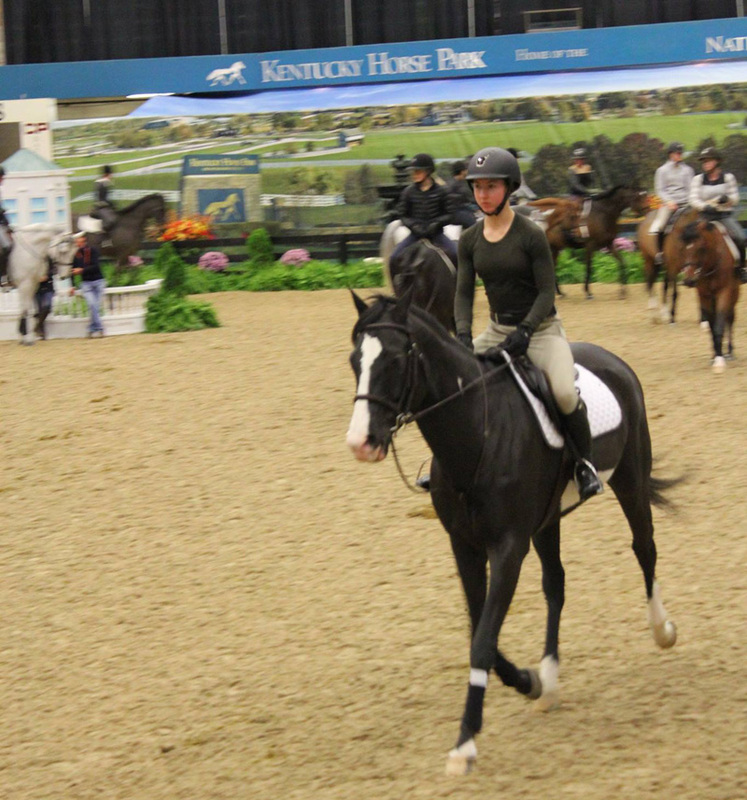 It’s always chaotic in the warm-up rings, but being at the National Horse Show made it even more intimidating. I’m glad that the competitors got to have the 90 seconds for the warm-up round on Friday morning. 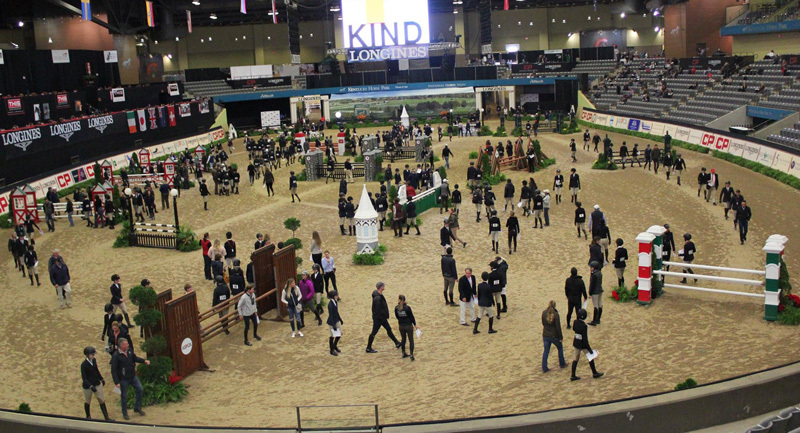 There is a course set up in the ring, and each competitor gets to choose their own course. The bell is sounded, and the 90-second countdown starts. At that time you get to jump as many jumps as you can in the allotted time. I felt much more confident after my 90-second warm-up round and a little less nervous for the next day. Normally I’m used to waking up at 3 a.m. for horse shows, but because of the time difference it was slightly more difficult to get up in the mornings. I was 64th in the order of go and rode sometime after 7:30 a.m. I thought I was going to be a lot more nervous for Saturday’s first-round class, but I was actually much calmer than I normally am. The chaotic atmosphere of the course walk normally would make me a bit anxious but surprisingly I stayed calm. I was very pleased with how my horse performed. Simon had never been to a show of that caliber before, and he handled himself just fine. It was really daunting standing at the back gate before heading in. The jumps were impressive, the stands are huge, and I definitely felt like I was in a fishbowl. Not to mention that seeing me and my horse up on the jumbo screen was a bit crazy. 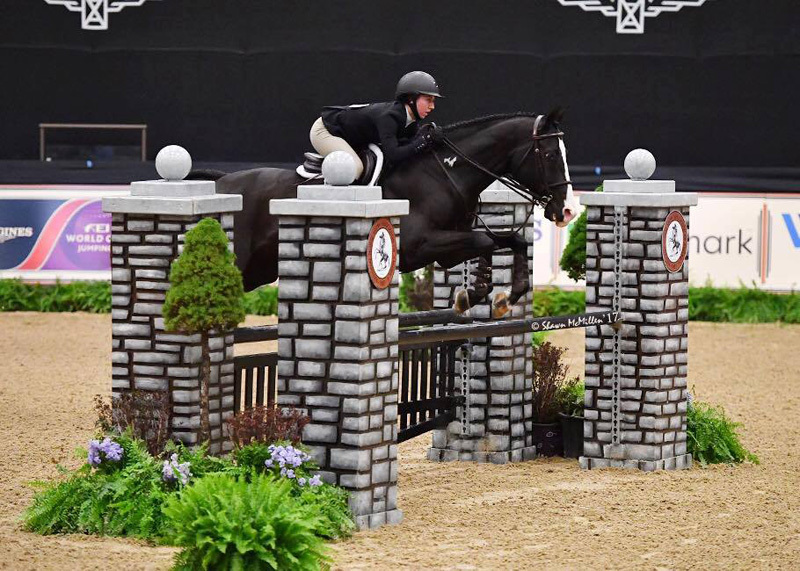 Several riders had trouble with Fence 6, the skinny with the ASPCA stone panel, and some horses were unwilling to jump Fence 1. My goal was to complete the course and have a good experience, both of which Simon and I accomplished. He over-jumped Fence 2, then at the triple bar we were in the air for quite some time, and we were deep to the last fence but besides that nothing too exciting. Jump 5AB was one of the places I was more nervous about because those were some stout oxers, but Simon handled them just fine. 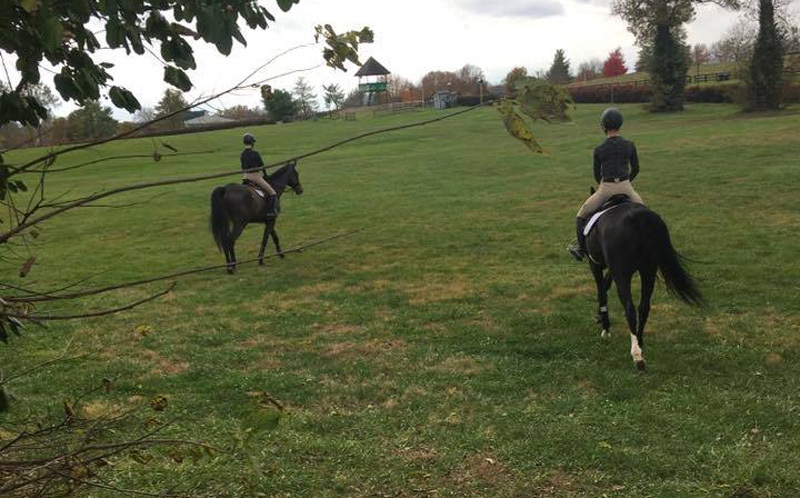 The other three juniors with whom I got to train have had experience competing in the big equitation finals, and it was nice to have them there and benefit from their confidence. They all rode super well. To conclude, I just want to thank everyone who helped me have this incredible experience. Thank you to Shelley and Jeff Campf, Dustin Goodwin and Oz Inc., for the support at the National Horse Show and the weeks leading up to it. Thank you to Mike & Mollie Gallaway (owners of Triple Rise Equestrian Center in Eugene) and Rachel Spears (my trainer for the past seven years) for their tremendous support during the past 10 years. Also to my barn family and community who helped send me and Simon: huge gratitude for making it happen. Last, but certainly not least, thank you to my mother and Simon, I never could have reached where I am without both of them; I am eternally grateful. Thank you to The Chronicle of the Horse for letting me share my first Maclay Finals experience!